Steelworkers in America’s industrial heartland faced many dangers in the early 1900s before federal workplace safety laws. But those in Donora, Pa., would put themselves and their families at particular risk while living in the shadows of a putrid row of zinc smelters. There were many horrific accidents as the steel belt bloomed around Pittsburgh, and Donora claimed its share of them. A month into construction of what would become known as U.S. Steel’s Donora works, a man named Rocchi Fiavelli fractured his skull in a fall from a tall building. The same day, Mike Dzugan’s right hand was severed by a circular saw in the Donora pattern shop, while blacksmith J. W. Campbell had his arm punctured by a sliver of metal, the Donora American newspaper reported July 5, 1901. A lad named Albert Hornbeck, working as a mill water boy, had his leg amputated after it was crushed between two rail cars in April 1905. Henry Clay Davis, 39, would die in May 1922 upon being crushed between two railroad cars serving the mill. Thirty-year-old Roderick Hastie, a Scottish immigrant, was killed while he was unloading a river barge a few days before Christmas 1923. Meanwhile, Michael Furda, 67, who was born in Slovakia, succumbed in February 1949 after his left leg was amputated following an accident at the blooming mill. But despite the risks, the machine continued to grind out steel and zinc while immigrant families did their best to create idyllic lives for their children in the smoky town. 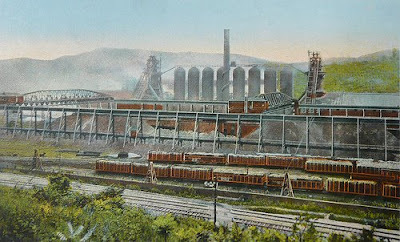 Promoters of Donora responded by publishing post cards, like the one shown above, that were made pretty with brush strokes of green paint to disguise the ugly surroundings. The casualties of steel went largely overlooked elsewhere, too, until late October 1948, when a mysterious fog settled over the Monongahela River. The eyes of the nation turned on Donora over startling news that 20 people had died there and at least another 600 were sickened by the thick air. Seventeen of the deaths occurred within just 12 hours, prompting health official to fear a pneumonia epidemic. Five days later, after rain had washed the air clean, a mill attorney ordered the cooling of the zinc smelters as mill chemists began arriving in Donora to spin the story. Investigators with the Pennsylvania Department of Health also came to town where the zinc mill had been spewing sulfurous fumes, carbon monoxide and carbon dioxide, along with various other heavy metal dusts into the clouds since 1915. The downwind residents in the village of Webster, Westmoreland County, were not about to be calmed by the rush of investigations. They had been complaining for years about that acidic air that had always quickly peeled fresh paint off their clapboard houses and turned them into worthless pieces of real estate. The acidic air had also stripped the land of nearly all of its vegetation for miles around Webster. After the smoke cleared a bit, those neighbors decided to hold secret meetings to oppose the mill, led by local restaurant owner Abe Celapino, who had a reputation for disliking the steel-making giant. His group called itself the Society for Better Living, adopting the credo: “Clean Air and Green Grass” in a charter that was approved by the courts in May 1949. Its members wanted to conserve soil, property and plant life and eliminate poison gases from the air because they feared for their lives over the smog deaths. The society criticized U.S. Steel for its strong influence over Donora Borough Council that had ignored its pleas for a local smog ordinance similar to the one that was on the books in Pittsburgh. No one was really surprised at council's decision because men who worked at the mill held six of the seven seats on council at the time. The U.S. Public Health Service, in a preliminary report on the smog that was never reopened, placed most of the blame on the smog deaths on the weather. A spate of Webster lawsuits lingered in federal court for several years before paltry settlements were reached without the mill admitting to any responsibility for the tragedy. It would take at least another decade before federal lawmakers recalled the Donora smog as a reason to enact the first federal clean air law. The folks in Webster breathed a sigh of relief while those across the river braced for the worst as the mill jobs began to disappear. Remembering Quecreek "nine for nine"